Increases serum calcium level through direct effects on bone, kidney, and GI tract. Decreases osteoclastic osteolysis by reducing mineral release and collagen breakdown in bone. Children: 1 to 7 mEq calcium gluconate I.V. 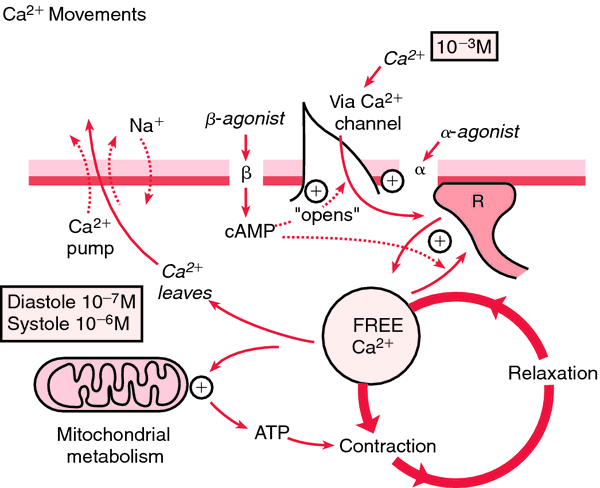 Infants: Up to 1 mEq calcium gluconate I.V. Adults: 0.027 to 0.054 mEq/kg calcium chloride I.V., 4.5 to 6.3 mEq calcium gluceptate I.V., or 2.3 to 3.7 mEq calcium gluconate I.V. Children: 0.27 mEq/kg calcium chloride I.V., repeated in 10 minutes if needed. Check calcium level before giving additional doses. Adults: Two tablets P.O. daily, given in divided doses t.i.d. with meals. May increase gradually to bring serum phosphate level below 6 mg/dl, provided hypercalcemia doesn't develop. ☞ When infusing I.V., don't exceed a rate of 200 mg/minute. • Keep patient supine for 15 minutes after I.V. administration to prevent orthostatic hypotension. • Administer P.O. doses 1 to 1½ hours after meals. • Know that I.M. or subcutaneous administration is never recommended. • Be aware that I.V. route is preferred in children. • Be alert for extravasation, which causes tissue necrosis. • Monitor calcium levels frequently, especially in elderly patients. • Instruct patient to consume plenty of milk and dairy products during therapy. • Refer patient to dietitian for help in meal planning and preparation. Control of hyperphosphatemia in end-stage renal disease. Binds to dietary phosphate to form an insoluble calcium phosphate complex, which is excreted in the feces, resulting in decreased serum phosphorus concentrations. Control of hyperphosphatemia in end-stage renal disease without promoting aluminum absorption. Absorption: Absorption from the GI tract requires vitamin D; 30–40% bioavailability. Contraindicated in: Hypercalcemia; Renal calculi; Ventricular fibrillation; Concurrent use of calcium supplements. Use Cautiously in: Patients receiving digitalis glycosides; Severe respiratory insufficiency; Renal disease; Cardiac disease; Obstetric: Hypercalcemia may ↑ risk of maternal and fetal complications; Lactation: Breastfeeding not expected to harm infant provided that serum calcium levels monitored. Hypercalcemia ↑ risk of digoxin toxicity.Chronic use with antacids in renal insufficiency may lead to milk-alkali syndrome.Calcium supplements, including calcium-containing antacids may ↑ risk of hypercalcemia; avoid concurrent use.May ↓ absorption of orally administered tetracyclines, fluoroquinolones, phenytoin, and iron salts ; take 1 hr before or 3 hr after calcium acetate.Excessive amounts may ↓ effects of calcium channel blockers.↓ absorption of etidronate and risedronate (do not take within 2 hr of calcium acetate).May ↓ effectiveness of atenolol.Concurrent use with diuretics (thiazide) may result in hypercalcemia.May ↓ ability of sodium polystyrene sulfonate to ↓ serum potassium.Cereals, spinach, or rhubarb may ↓ absorption of calcium supplements. Oral (Adults) Hyperphosphatemia in end-stage renal disease—1334 mg with each meal, may ↑ gradually (in absence of hypercalcemia) to achieve target serum phosphate levels (usual dose = 2001–2668 mg with each meal). Lab Test Considerations: Monitor serum calcium twice weekly during adjustment phase. If serum calcium level is >12 mg/dL, discontinue therapy and start hemodialysis as needed; lower dose or temporarily stop therapy for calcium level between 10.5 to 11.9 mg/dL. Monitor serum phosphate levels to determine efficacy. Oral: Administer on an empty stomach before meals to optimize effectiveness in patients with hyperphosphatemia. Advise patient to notify health care professional promptly if signs and symptoms of hypercalcemia (constipation, anorexia, nausea, vomiting, confusion, stupor) occur. Advise patient to avoid taking calcium-containing supplements, including calcium-based antacids during therapy. Control of hyperphosphatemia in patients with renal failure. An agent which is used to lower serum phosphate levels in patients with hyperphosphataemia; in patients with end-stage renal disease; neutralise fluoride in fluoridated water; and as a food additive, in which it acts as a stabiliser, buffer and sequestrant. Phosphate solubilizing bacteria from subtropical soil and their tricalcium phosphate solubilizing abilities. Functionalised tricalcium phosphate (fTCP) is produced through beta tricalcium phosphate ([beta]TCP) complexes being milled with sodium lauryl sulfate (SLS) . In this context, the acceptance test was conducted with the three beverages, A, B, and C, containing the following calcium salts: calcium carbonate, calcium citrate malate and tricalcium phosphate, respectively. They used tricalcium phosphate as source of P and reported solubilization levels between 156 and 620 mg x [L.
It would appear from these results that tricalcium phosphate was more effective in fixing As in the contaminated than rock phosphate, while the latter appeared more effective in fixing Cr and Cu than calcium phosphate in the contaminated soil. Osteon", an osteoconductive mass, consists of a bone-salt (hydroxyapatite) and tricalcium phosphate. Tricalcium phosphate may be used as the calcium source in some products. Anterior cervical discectomy and interbody fusion, an experimental study using a synthetic tricalcium phosphate. Kohmura, Effects of additives on hydration and hardening of tricalcium phosphate. Collagen as an osteoinductive material is due to its osteoconductive property and when it is used in combination with osteoconductive carriers like hydroxyapatite or tricalcium phosphate.